IDJ has sent a March 1921 China Mail special supplement showing a proposed bridge linking HK Island to Tsim Sha Tsui in Kowloon. Tymon Mellor: This was not the first time such a bridge had been discussed. “The Harbour Master in 1901 proposed the construction of a cross-harbour bridge between Pottinger Street on the Island and Robinson (Nathan) Road”. See article linked below. At the bottom is a sketch of the proposed bridge design. Mak Ho Yin has translated the Chinese characters beneath this, “Diagram of the proposed iron bridge from Hong Kong Island to Kowloon”. IDJ adds: the additional four lines below were added by the author of a thesis to which this page was attached. He had been writing about early Kai Tak and the original land development company. HF: Why would such a bridge terrorize these parents? This is the section of the March 1921 China Mail special supplement relating to the proposed bridge: “During the last two years a great deal of interest has been excited, and a good deal of matter written, concerning the question of over-crowding in the City of Victoria, and the possible means of making provision for the increased population if large schemes for the resumption of insanitary properties are initiated in the near future. A good many of the propositions put forward with regard to the housing problem appear to be based upon insufficient acquaintance with the conditions which render building operations so expensive in the Colony; but most of the suggestions with regard to the making of land and the opening up of new areas, should commend themselves to the consideration of the community. There can be little doubt that, important as has been the part played by Hongkong in the past as a centre of trade and enterprise in the East, it has a future pregnant with far vaster possibilities as a great port and distributing goods in the years to come. It seems to be equally evident that, with the completition of the Canton-Hankow Railway, and the pacification of the Southern provinces of China, Kowloon is destined to become a populous and prosperous city. That these two important towns should remain for ever separated by a stretch of water not more than a mile wide at its narrowest part is, in these strenuous times, obviously out of the question. It is remarkable that, as the two sides develop, our successors here will go on being compelled to catch ten-minute ferries – which are liable to be suspended in bad weather. Under such circumstances this seems to be a suitable time to recall to the memory of residents the scheme for a bridge across the harbour which was first suggested by Captain Murray Ramsey R.N., some years ago. At the time the idea was received rather as in the nature of a good joke, but the time has come when it may well be taken into consideration as a serious proposition. The width of the crossing from Pedder Street to Kowloon Point is approximately 5,100 feet; so that a road surface rising 1 in 20 from each shore will give a clear headway of over 100 feet in the centre, and would be clear for the passage of ocean-going steamers through the central spans if it were considered necessary – though there would seen to be no great condition to ships coming in at either end of the harbour out again by the same passage. The extreme depth of the harbour is about 40 feet diminishing to about 25 feet at a few yards from the Praya walls, so that work under water would be strenuous but not prohibitive, and the nature of the soil on the island and the mainland is such as to encourage the belief that a hard foundation would be found at a moderate depth. The cost would undoubtedly be heavy, and it is not the intention in this article even to suggest what it might be, but with a great commercial future before it involving vast imperial interests, almost any figure might be met and examined with equanimity. The bridge should provide a roadway for electric trams and for motor and for ricsha [sic] traffic, as well as a way – perhaps a covered way for foot passengers. 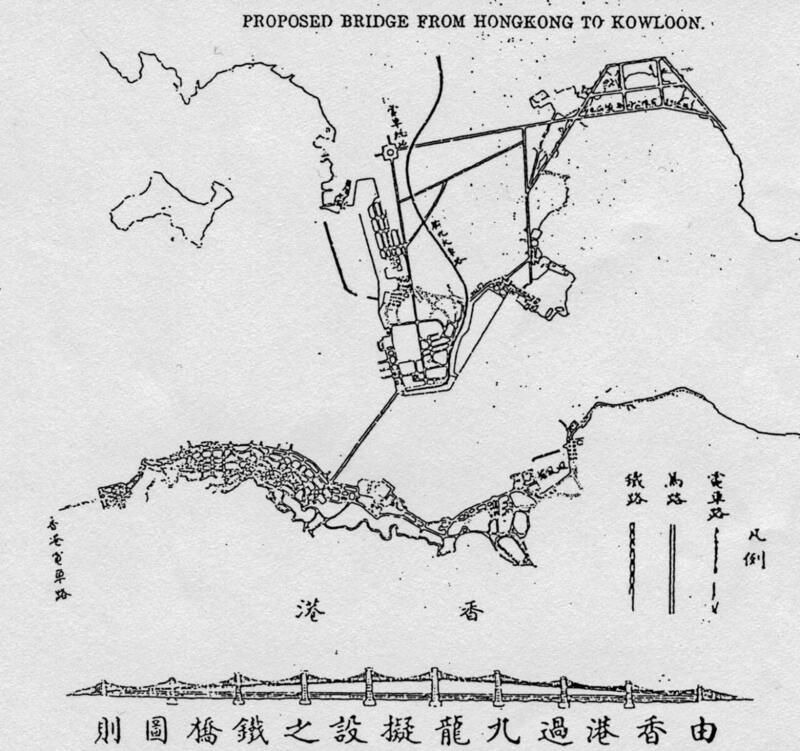 If such a bridge were constructed the problem of preparing well-arranged building sites, wirh wide roads and ample open spaces, would be at once and for all time provided by the opening up of large areas of more or less level ground suitablem according to their position, for Chinese or European occupation, below and on the slopes of the Kowloon Hills. All of these sites would be within reasonably easy access of the business centre of the city of Victoria, which will probably always remain the hub of commercial activity in the Colony. In the 1920s the KCR (East Rail Today) wanted to extend to Hong Kong Island.Today in the 21st Century we are looking at the construction of the East Rail Extension to Hong Kong Island.Over 100 years later this plan will become a reality. Many thanks for your comment Timothy. As you say an interesting proposal that’s been around for years. Do you happen to know where I can find further details about the 1920s KCR proposal or a contemporary East Rail Extension to HK Island link? All the information about an East Rail extension can be found on the Sha Tin to Central link website.